I’ve been rather lukewarm to The Mountain Goats‘ recent output, with recent being anything released after 2005’s magnum opus The Sunset Tree. 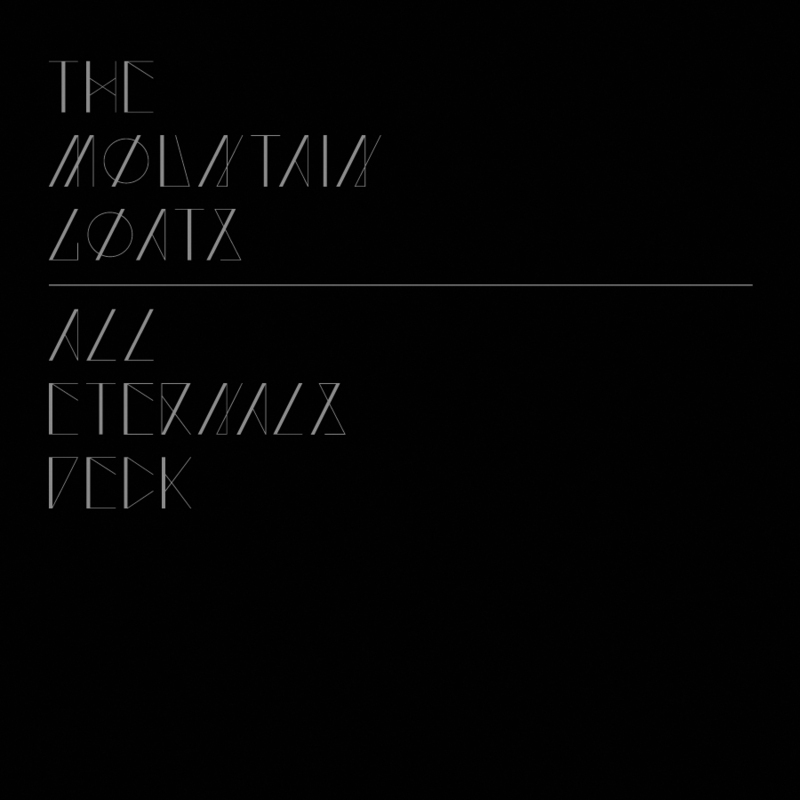 Earlier this year the band released their seventh studio album, All Eternals Deck. Having been disappointed by the last three albums by the band, I was hoping it would be good, but I was bracing myself for disappointment. Fortunately, it turned out it wasn’t half bad. It’s probably the band’s best album since The Sunset Tree. While I’m not exactly loving it from start to finish, it does have a sufficient number of sufficiently catchy songs, and it seems to work great in the car – which is always a bonus. Like The Life Of The World To Come, this album goes with a particular naming convention as its vague concept, with the album and song titles being only three words long, apparently because the number three is considered significant in the traditionn of Western mysticism. This is also the third album on which drummer Jon Wurster is a part, who joined the band as its third member together with Peter Hughes on bass and (of course) John Darnielle on guitar and vocals. The band generally sounds more band-y than ever on this record, at least if you strip away some of the studio magic from some of the tracks. Several of the songs have a somewhat raw, straight forward, garage sound to them, especially on tracks such as “The Birth Of Serpents”, “Real Estate Sign” and “Prowl Great Cain” – which are three of the album’s highlights. But the band is still fighting an ongoing battle against blandness. I linked a friend to the band’s performance this year on David Letterman (which you can view here), but he said he turned it off halfway through as it sounded too bland and dull for him. And yes, the band has become increasingly bland over the last few albums, starting to sound more like all your other run-of-the-mill overly-polished radio-friendly indie bands out there. The Mountain Goats still does have some clear advantages over such acts though, such as more interesting vocals, catchier melodies, and certainly better lyrics. I did find the lyrics on this album generally unexciting though, perhaps being too wrapped up in themselves to really give much meaning to anyone but the songwriter. That’s not uncommon for The Mountain Goats, but usually there are at least a couple of songs on each album that make immediate sense lyrically to impatient philistine hipsters who just want to shake their butts while enjoying some easily digestible but clever lines, like “This Year”, “No Children”, “Woke Up New”, “The Best Ever Death Metal Band In Denton”, or “Sax Rohmer #1”. John Darnielle also frequently uses similes in his lyrics, which is something that has started becoming a pet peeve of mine. I can think of two reasons for my growing dislike. The first is simply that he does use it so frequently, and I’ve become so aware of it, that it becomes predictable, grating, and somewhat uninteresting. The second reason is because it almost pauses the lyrical flow and narrative, as if the singer / songwriter is saying “Hang on for a minute, dear listener, while I compare this thing to this other thing”. Similes certainly have their place, both in lyrics and poetry, but should be used sparingly so that they may have their full effect when they are used. But nitpicky negativity aside, the album is overall pretty decent. 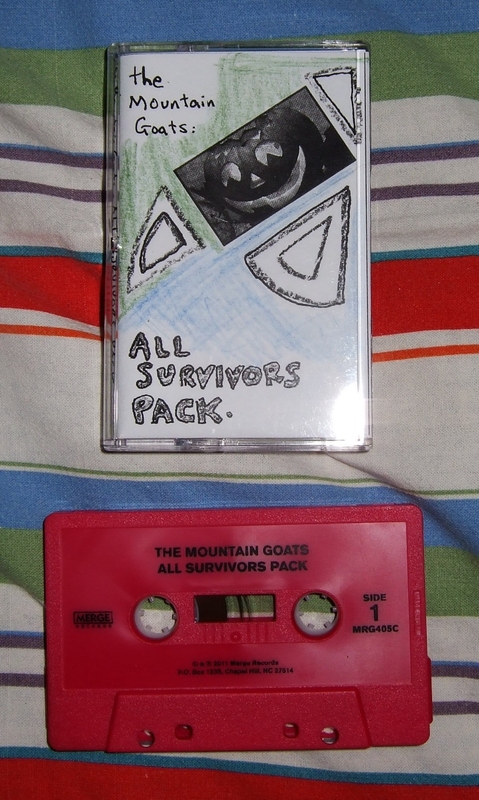 The first 500 who pre-ordered the album through Merge’s website were also treated to a copy of the cassette tape All Survivors Pack, featuring demo recordings of 10 tracks off the album plus two demo recordings of songs that didn’t make the final cut. It’s a neat little item, and the tape itself is in a gorgeous pink colour (even if the actual cover is a bit on the garish side). The tracks are interesting, but generally not as good as the studio album counterparts (perhaps in part because they were indeed demos and not meant as fully finished pieces, and on a couple of the songs John makes a few mistakes), with the clear exception being “Birth Of Serpents”. The version found on the tape is great, and I definitely prefer it to the studio version. It’s lo-fi and minimalistic, but features some some subtle multi-layer recording, and it’s the demo track that sounds the most complete to me. I halfheartedly wish that the entire album could have had a similar sound. As a treat, here’s the track in question. And just earlier this year the third annual fan-made compilation of The Mountain Goats cover songs was released online by the members of the official The Mountain Goats forum, entitled If We Get There At All, borrowing a line from the excellent “Shadow Song” off The Coroner’s Gambit. So as a bonus, I’m attaching two songs from said compilation, one being the one I contributed under my artist name The Society Of Poor Academics, and the other being my non-me favourite track from it by one Lara Mishler. This entry was posted in music and tagged lara mishler, review, The Mountain Goats, tsopa. Bookmark the permalink.